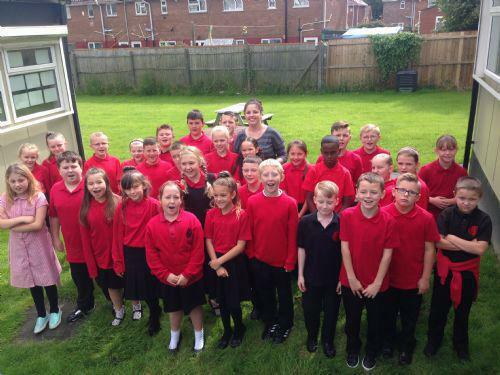 Welcome to our Year 5 class page! To end the busy year our final topic is Energy. This project has a focus on science and teaches children about the different sources and types of energy. They will use their ICT skills to research the debate on positive and negative impacts of energy to then create letters, leaflets and arguments. The centre of the topic is focused around creating a mini wind farm where children will be designing wind turbines, recording scientific information and reporting on their findings. Year 5 and 6 had a lovely time in Barry Island and Porthkerry Park on Monday. The weather gradually improved and the sun did put in a few appearances! The morning was spent in Porthkerry park where we enjoyed playing games, participating in a woodland walk and spending time on the beach. We walked over to the Knapp for lunch and ended our day in Barry Island. The arcades and ice cream were a big hit as well as the climbing wall. The day flew by and fun was had by all. I have uploaded a few pictures. We have been planning a story for a competition this week. The competition is called 'Ancient adventures' and the children have to write a 100 word story about a historical figure or era. Some have chosen to write about Anne Frank, some WW2 and others the Victorian era. Miss Hill-Tout has loved reading all their wonderful ideas. We have also been writing our own poem based on the Magic Box by Kit Wright. They have had excellent ideas of what they would keep in their box ranging from dinosaurs to chocolate and the 'fresh smell of bread'. As well as language and maths, they have been looking at non-renewable and renewable sources of energy in their topic work. We have used the ipads to research coal and the coal miners and how important coal was in the South Wales Valleys. We have had a busy week planning for our school time capsule. This month the school are burying a time capsule which will not be opened for 50 years, the children will be 60 by then which is a very scary thought. We have been writing a diary entry about our lives in 2016, and had lots of fun researching what life was like 50 years ago compared to now. Some of the children couldn't believe there were no iphones, internet or Mcdonalds! We have had another busy week in year 5 and had some very excited children on Friday going to Kingswood, we hope they all have a lovely time. This week we have continued to practice counting money and working out change, they have worked really hard on different techniques to do this and Miss Hill-Tout is so proud of all of them with their perseverance. We have also begun to write a persuasive letter about school uniforms, research renewable and non-renewable energy and have really enjoyed creating our own raps with Mrs Herco -Thomas in music. As you all know the Summer Fayre was on Tuesday the 14th and a big thank you to all who came and supported the school and especially year 5. Our stress balls, glasses and lucky dips were a great success and the children had lots of fun making them. Diolch yn fawr! Getting ready for the Summer Fayre! We hope you had a lovely week off and are ready for the last few weeks of this busy Summer term. We have had a busy start to the term getting ready for the Summer Fayre. We look forward to seeing you all there on Tuesday the 14th of June. This week we have been working on our story writing skills in language. They started the week off creating mind maps and planning an interesting story based on the adventure/horror genre. In mathematics we have been concentrating on counting money and mental techniques of rounding up. We have a very busy term ahead full of different activities for the children but also for parents. A newsletter has been circulated but as a reminder here are a few important dates for your diary. We look forward to seeing you all there!